The mission of Living Jazz is to Transform Lives Through Music. Since 1984, Living Jazz has designed and launched unique music education and performance programs that instill confidence, responsibility and ambition in children; motivate people of all ages and backgrounds to reach their personal and creative potential; and unite diverse communities through their shared love of jazz and related genres. Our current programs include Jazz Camp West, Jam Camp West, “In the Name of Love”, the Annual Musical Tribute honoring Dr. Martin Luther King, Jr., The Living Jazz Children’s Project, Jazz Search West and the (Not So) Tiny House Concert Series. Living Jazz understands that music is an inherent component of a healthy and vibrant society and feels that every child and adult has the right to accessible, high quality music immersion experiences. Grand Finale at Yoshi’s Oakland, April 30, 8pm! Living Jazz believes that music transforms lives and has remained committed to this belief since it’s inception in 1984. 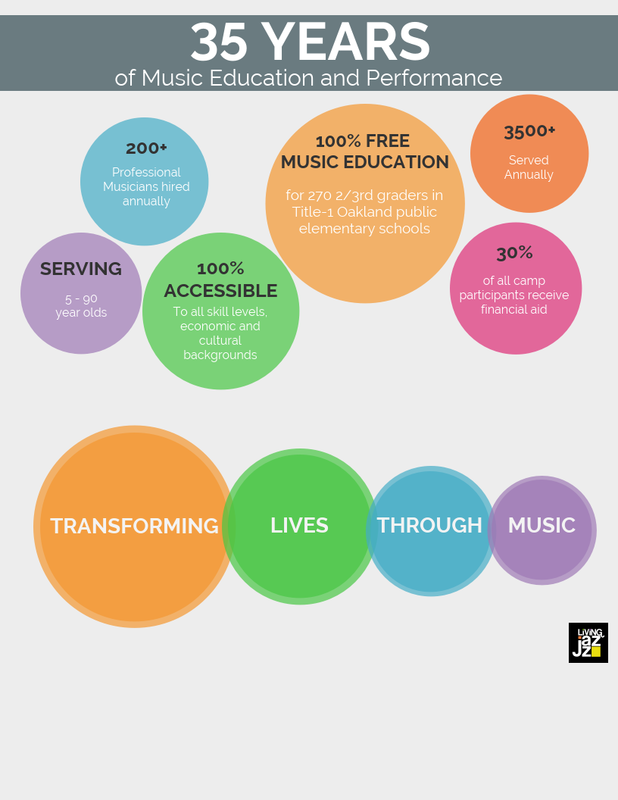 The programs of Living Jazz are known not only for their artistic quality, but also for their commitment to build community based on diversity, inclusion and accessibility; the distinctive way in which they encourage and support artists of all skill levels; and the artistic and personal growth they foster in participants of all ages. An 8-day jazz immersion program for adults and teens of all skill levels held in a stunning redwood forest in Northern CA. A 7-day music, dance and vocal program for 10-15 year olds of all skill levels and backgrounds held in the stunning redwoods of Loma Mar, No. Ca. The Bay Area’s Annual jazz talent search for adults and teens (15 and up). An extensive civic and cultural event celebrating, through music, the teachings of the great Dr. Martin Luther King Jr.
A free weekly music education and performance program for Oakland Title One public elementary schools. An intimate concerts in private homes throughout the Bay Area featuring local and touring artists.